Had the NHL’s outdoor hockey game at Dodger Stadium been a humbling failure – if it was way too hot and, like, Ryan Getzlaf literally fell through the ice in the third period – it could have set back plans to bring the Stadium Series to non-traditional (i.e. snow free) markets. 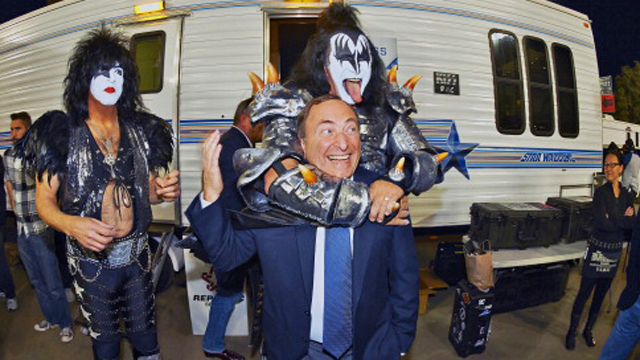 Instead, it was pretty much the coolest thing ever, from the aesthetics of the grassy baseball diamond to Gary Bettman meeting KISS. Thus began the speculation on whether San Jose would get its own outdoor game, and CSN Bay Area’s Kevin Kurz says it’s expected they’ll host one in 2015-16 at either AT&T Park in San Francisco, home of the Giants, or Levi’s Stadium in Santa Clara, where the 49ers will begin playing next season. AT&T Park would probably be the better option for both the league and the Sharks. Known as one of the most picturesque stadiums in the country, sitting on the edge of the San Francisco Bay and what’s known as McCovey Cove, it would provide breathtaking visuals for a national broadcast much like NHL games at Wrigley Field and Fenway Park in the past. It could help the Sharks to grow the game locally in the San Francisco area, and be easier to fill to capacity, as AT&T Park holds 41,503 fans as compared to the 68,500 seats at Levi’s Stadium. Of course, Kurz is burying the lede here, which is that PEOPLE CAN CATCH WAYWARD PUCKS IN BOATS. Sharks chief operating officer John Tortora told the Mercury News in January that San Jose was likely to get an outdoor game if the Dodger Stadium game worked (it did) and if the NHL was to continue the Stadium Series next season, which Gary Bettman has indicated it will, saying that the total number of teams that will have played in outdoor games will reach “23 or 25” after the next round of outdoor games. Obviously this brings us to the two most important questions: The opponents – will the Los Angeles Kings venture outdoors for a second straight season? – and, of course, what cool jersey the Sharks will wear. Is it difficult to re-letter a chain mail jersey?